PACUNAM President Marianne Hernandez, Carmen, Bel and Isabella. When Carmen met young Guatemalan designer Isabella Springmuhl at a conference in Costa Rica over a year ago, she fell for her, as many who meet her do. Not only for her incredible story - Isabella has Down’s Syndrome, and overcame many hurdles to become a designer, not only for her work ethos and commitment to employing the talented local artisans in her home country - a value much aligned with Carmen’s - but ultimately for her sheer positivity and fearlessness. Carmen meets Isabella at her home in Guatemala City, and looks through her sketches. You can read more about how she turned around the many “nos” she received - including a rejection from her local university due to her condition - into “yesses”, and how she started her own brand Down to Xjabelle, here. And you can see the standing ovation she received for her impassioned presentation in Costa Rica this June, here. But on this trip to Central America, Carmen got to spend some time with Isabella at home, learning more about her family, her life as an early twenty-something emerging designer, and all the projects she works on with the help of her mother. Isabella goes through sketches at home in Guatemala City, with her mother, Isabel, who goes by “Bel”. One of these projects is Fundación Margarita Tejada, a non-profit foundation which began in 1998 on the initiative of 10 mothers of children with Down’s Syndrome, one being Isabella. The foundation generates development opportunities for people with the condition, making the equity and social, school and work inclusion of people with Down’s a reality. The foundation runs a wide range of impressive programs for children with Down’s Syndrome, ones that address specific health and psychological needs, to academic and workforce-specific initiatives. You can find out more about the foundation and donate should you wish, here. Children from the Fundación Margarita Tejada on an interchange program with the local Montessori school. The most-recognized fashion designer in Guatemala, Isabella’s designs have not only received acclaim in her country, but on the international fashion stage too. In 2015, Isabella was invited to showcase her work at Guatemala City’s Museo Ixchel del Traje Indigena (Museum of Indigenous Textiles and Clothing), which explores the Guatemalan traditions of dress throughout the country. The following year, at just 19 years of age, she was the first fashion designer with Down's Syndrome to take part in London Fashion Week, participating in the International Fashion Showcase, and was also among the list of inspirational and influential figures named among the BBC’s 100 Women. Later that same year, Isabella was also invited to showcase her collections in Rome. Artisans bring Isabella’s creations to life. An homage to traditional Guatemalan handicraft, they feature richly colorful textiles woven by indigenous Mayan women, which Isabella combines with modern silhouettes to create authentic yet contemporary clothing. 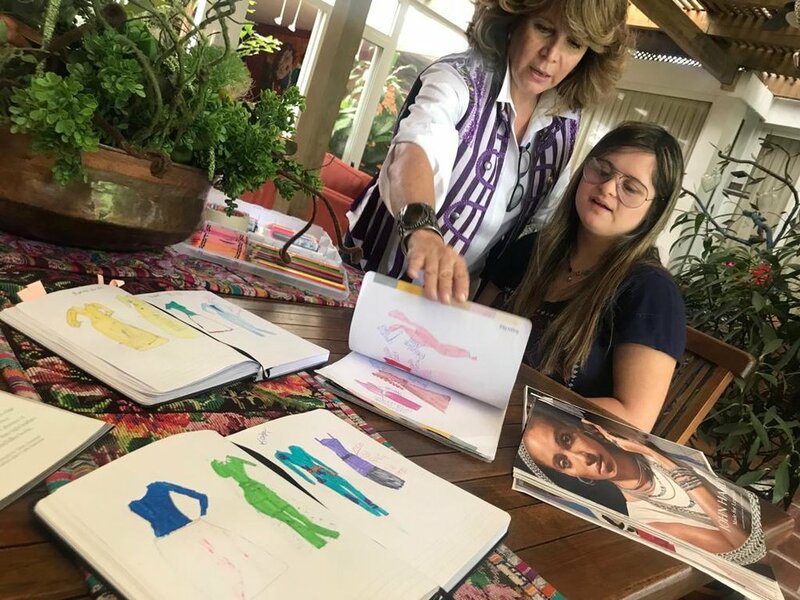 Being such an inspiration aged just 21 - not only for people with Down’s Syndrome, Latin Americans, and emerging designers everywhere - we can’t wait to see what Isabella accomplishes in the next few years.